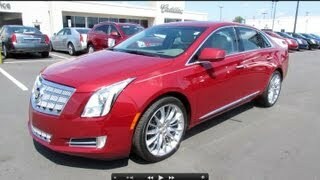 Cadillac XTS 2013 is the latest addition to the Cadillac luxury sedan lineup. Larger than the CTS, the new XTS delivers the space, elegance and dramatic presence that are Cadillac signatures, but with entirely new and technically advanced methods tuned for a new generation of luxury customers. It arrives in U.S. and Canadian showrooms in the spring of 2012 as the most technologically advanced production car in the brand’s history. 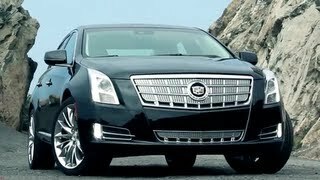 Los Angeles – Cadillac unveiled the 2013 XTS today, the newest addition to the Cadillac luxury sedan lineup. It arrives in U.S. and Canadian showrooms in the spring of 2012 as the most technologically advanced production car in the brand’s history. Larger than the CTS, the new XTS delivers the space, elegance and dramatic presence that are Cadillac signatures, but with entirely new and technically advanced methods tuned for a new generation of luxury customers. It also marks the debut of CUE, acomprehensive in-vehicle experience that merges intuitive design with auto industry-first controls and commands for information and media control. 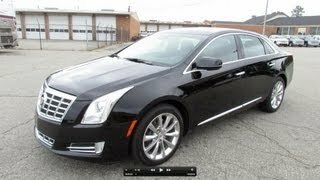 In addition to the CUE interface and connectivity, many other advanced technologies are integral to the new XTS. It will be the only luxury sedan with standard Magnetic Ride Control – the world’s fastest-reacting suspension. Advanced technologies that enhance vision and safety surround the driver are available as well. Positioned directly above the centerpiece CTS family in Cadillac’s revamped lineup, the new XTS features a 3.6L direct injection engine and advanced all-wheel drive system, marking a shift to more-efficient performance in a spacious luxury sedan. Cadillac CUE is the highly customizable user interface that exemplifies XTS’ blend of advanced technology and artistic design. The heart of CUE, which stands for Cadillac User Experience, is the standard eight-inch (203 mm) screen in the “center stack,” the faceplate below the screen and the steering wheel controls. CUE features several industry firsts, including capacitive-touch control with proximity sensing, gesture recognition and natural voice recognition. The XTS is also the most-spacious Cadillac sedan, tailored to provide roominess in a more efficiently sized package. It offers more interior space than midsize luxury cars and comparable to full-size sedans, particularly in the rear seat area, where it has 1,016 mm of rear legroom. That’s about four more inches than the BMW 5 Series, and Mercedes-Benz E-Class and about two more inches than the Audi A6 – and comparable to larger sedans. And when it comes to trunk space, the XTS is in a league of its own, with 509 liters, exceeding both midsize and full-size competitors – more than Audi A6 and A8L, BMW 5 and 7 Series and Mercedes-Benz E- and S-Class. For XTS customers, the cargo advantage means room for five or more suitcases. XTS’ hardware and spatial dimensions are the foundational layers that support a new level of surface detail. Multidimensional exterior and interior elements, including the grille, headlamps and new use of accent lighting, coalesce to give the XTS a presence and attention to detail unlike any Cadillac that has come before it. CUE, for example, represents the pinnacle of technology, but it is being showcased using a subtle and sophisticated interior appearance that blends with other features to create a soothing and inviting feel. It offers more capability and driver-selectable choices than ever before from Cadillac, but the center stack has only seven buttons – three of them for the radio. That’s less than half the controls found on the center stack of the typical car. The XTS’ surface details also convey a more-nuanced design philosophy, with elements that support the long, sleek proportion that is a welcome return to Cadillac. They bring forward more beauty and elegance with refined, graceful forms and surfaces working harmoniously with established Cadillac linear forms. It is a car that conveys the next step in Cadillac form and surface vocabulary. The XTS Platinum is the fullest expression of Cadillac’s multidimensional philosophy, with features that include a chrome/satin-chrome grille finish, polished 20-inch aluminum wheels with chrome inserts, a fully wrapped leather interior with Alcantara headliner and more. The XTS’ technology fundamentally supports a suite of advanced safety features, based on a “control and alert” strategy that extends the vision around the vehicle. It helps drivers identify potential crash situations and even intervenes when a crash threat appears more imminent, employing layers of visual, audible and tactile (vibration) alerts, depending on the alert feature. The alerts are designed to identify obstacles with sufficient warning to give the driver time to react and make changes – including the Safety Alert Seat feature, which vibrates either the left or right side of the driver’s seat cushion, depending on the location of the impending concern. The intervening features, including Automatic Collision Preparation, take over if the threat appears more immediate or the driver does not react to previous alerts. Two levels of control-and-alert protection are offered in the XTS’ Enhanced Safety Strategy (ESS) packages. A layered approach to the driving experience relies on new and established technologies – all rooted in a stiff structure. The body is infused with strategically placed ultra-high-strength steel for strength and crash protection and serves as the foundation for the advanced-chassis system. A smart Haldex all-wheel-drive system – with an electronic limited-slip differential that splits torque between the rear wheels – complements an advanced HiPer Strut front suspension and standard Magnetic Ride Control real-time damping to give the XTS sure-footed, confident and comfortable ride and handling traits. A linked H-arm design with “air springs” comprises the rear suspension. Magnetic Ride Control delivers precise body motion control – “reading” the road every millisecond and changing damping in just five milliseconds. It replaces conventional mechanical-valve shocks with electronically controlled shocks filled with a magneto-rheological fluid containing minute iron particles. Under the presence of magnetic charge, the iron particles align to provide damping resistance almost instantly. StabiliTrak electronic stability control is standard on all models, along with variable-effort steering and Brembo four-wheel disc brakes with four-channel antilock brakes – all features that add important layers of control to the driving experience. Like Magnetic Ride Control, XTS borrows the Brembo braking technology from Cadillac’s V-Series of high performance models. 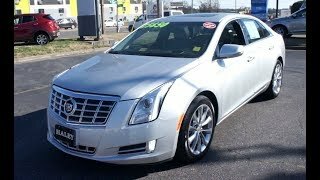 Horsepower for the XTS comes from an advanced 3.6L V-6 that’s known by its “LFX” engine code. It is rated at an estimated 305 PS (224 kW). Lightweight features help reduce overall weight for greater efficiency and a more favorable front-to-rear weight balance. Examples include a composite intake manifold saves approximately 2.5 kg over the weight of a comparable aluminum intake and an integrated cylinder head/exhaust manifold design that saves approximately 6 kg per engine. The XTS will begin production in Oshawa, Ontario in spring 2012.